It's Mother's Day! So far: absolutely amazing! VegKid woke me up with a homemade card + lots of love and kisses. 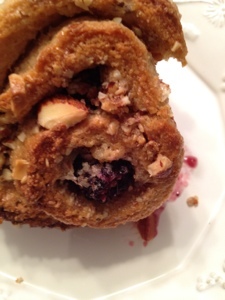 We had these yummy, oh-so-filling, blackberry brunch buns (couldn't think of a better name) this morning. My mother came by just in time for brunch and she brought the coffee! Best. Mother. Ever. We have plans for a vegan feast tonight, but I am so full from brunch, I can't even think about that right now. I will keep you all posted on the feast to come (I would never miss an opportunity to feast). While the bread was rising, we planted a vegetable garden in VegKid's little greenhouse. Add the yeast packet, teaspoon of sugar and warm water in to a mixing bowl. Let sit for about 2 minutes or so. Add in the ingredients from the second group and start folding together. As dough thickens, begin to knead in bowl. Knead until a smooth ball forms. Keep the ball in your floured bowl and place in a warm spot, covered, for about an hour - or until dough doubles in size. (preheat the oven to 400 degrees.) Punch out dough and transfer to a floured work space. Roll out to about a 1/2 inch. Sprinkle the sugar over top evenly. Then add bits of the butter - scattered all around. Add the blackberries. Then drizzle the vanilla extract over the dough. Lastly, chop the almonds and add them; drizzle of maple syrup over top. Roll the dough up tightly. Slather some vegan buttery spread around 9" cake pan - glass; then flour the inside as well. Slice the rolls and transfer, spiral side up, to the baking dish. Drizzle an additional 1-2 tsp of maple syrup over top. Bake at 400 degrees for about 15 minutes, then lower temperature to 350 and bake for an additional 30 minutes - or until the edges of the rolls start to brown and the center becomes slightly toasted. Remove the rolls from the oven and let them cool at least 20 minutes before serving.